Cropped, wide-leg fit, snakeskin print. Images with model from the Anthropologie website to illustrate length, see other photos for accurate colour. Incredible Hitherto for Anthropologie Dress in a beautiful grape/muted grey colour. Worn once to my sisters wedding and in perfect condition. Fully lined in flesh coloured pink and with a flattering scalloped edge. Condition is Used. Dispatched with Royal Mail 1st Class. New Anthropologie Red & Pink Cotton Shirt M (Fits UK 10-12). Gorgeous, vibrant color Top for any occasion ! Closes with buttons. ANTHROPOLOGIE- LA FEE VERTE -. Soft, warm and cosy! Yet filled with high fashion. Great colours, super soft chenille furry material. Great sweater cardigan! The value of the item is the one I sincerely think it is worth. Shoulder to hem: 26”. Pit to hem: 15”. Black with a beige floral design, fully lined with a beige chiffon (with black edging to the hem). A used item in good condition. Silky neck tie. Shoulder 40cm. Shoulder to hem 56cm. Moth Anthropologie V Neck Jumper. Ribbed Effect. 52% Rayon, 28% Polyester, 20% Nylon and Hand Wash Only. Length 25". Beautiful Eloise by Anthropologie black, white and red floral long length belted loose flowing kimono with sheer lace panel and trim. SizeXS / S but comfortably fits larger sizes due to the loose open style. Here we have a lovely orange shirt by Mine for Anthropologie. Length- 61cm. This top is in excellent used condition. Worn once. Online exclusive from Anthropologie. Hand wash only in cold water. Back from neck to waist 16.5"/42cm from waist to hem 18"/65cm. The body finishes with a pronounced shirt style hem. Sleeve from underarm to end 19"/48cm. Across the front underarm to underarm 21"/53cm. Beautiful cream blurred ikat like floral branches on deep grey background. Classic A-line, this Moulinette Soeurs skirt will never go out of style. It is a US 0 and fits a UK 6. Model : Space Dyed Cotton Loose Knit Cardigan. Loose knit. Colour : White & Black. Material: 96% Cotton 4% Acrylic. Off-set feminine bow. Material: 98% Polyester 2% Elastane. This dress is in good used condition. No marks or flaws. Length- 93cm. Side pockets, fully embroidered, blanket stitch edging around collar. Back split. (Here we have a fab dress from Corey Lynn Calter for Anthropologie. Size: the label says US 8, but I would say more of a UK 10 tbh. Waist 28", bust 36". I’m a teensy bit of a hoarder and am having a massive, long overdue clear out of my wardrobes, attics and sheds :). Anthropologie Maeve Size 4 (Small) Woodland Creatures Henley Moonflower Popover Blouse. Very lightly worn - this is a beautiful top with cute woodland creatures in vibrant light and dark pink and orange on a dark blue background - perfect for spring! ANTHROPOLOGIE, Crushed Velvet Blouse, Champagne/Pink, M, RRP: £78, NEW! RRP £78.00! ANTHROPOLOGIE, Velvet Blouse with Floral Sleeves. - Crushed velvet. Colour: Gorgeous champagne with slight blush pink. - Elastic cuff. Fully lined striped floral viscose dress with flared sleeves. Anthropologie designer Baraschi skirt. Labelled Sz 8 looks like UK 8/10. Pencil, chiffon outer, heavily embroidered. Lined, rear zip. Anthropologie Knee-Length Tunic Dress. - Style: Knee-length tunic dress with 3/4 sleeves. - Embroidered floral detail. Farm Rio Anthropologie black pencil skirt lightweight Viscose front button closure Ladies G UK 14 16. Style and Details: Great little black pencil/ slight A line skirt. Lightweight and soft it is made from 90% Viscose 10% Elastane. Bailey 44 Lace Column Dress Anthropologie XS Wine. Condition is Used. Dispatched with Royal Mail 2nd Class. Gorgeous and very flattering thanks to the wraps of material. Fully lined. This is a lace Column dress by Bailey 44 from Anthropologie. This dress is a deep purple / wine in color. Size Xs. the only sign of wear is to the label itself which is common with Bailey 44. worn once for a wedding. Smoke free home. Anthropologie Maeve Anthousai Bell Sleeve Floral Dress. Gorgeous Floral Print. UK Size Small. Anthropologie Bl^nk Geble Dress Medium/UK12 New with Tags! Anthropologie Bl^nk Geble Dress. Length at front of dress 41". Back of dress 49". Dress has an attached pink jersey slip underlay. Underlay from top of shoulder to hem 35.5" approx. Georgette material with ruched beaded bodice. Here we have a gorgeous black cropped blazer with a beautiful bow and a practical zip. Size: UK 6. Regular yummy promotions. Underarm to underarm: 45 cm. Model : Betje High Neck Maxi. Colour : Mixed - green/red/black/blue/beige. Neck clip fastening front. Chest (underarm to underarm): ~94cm. Elasticated waist. Waist: ~69cm. Model : Vittoria Striped Midi. Size : UK6. Colour : Multi - Black/Khaki/White/Pink/Purple/Grey. Side Slits. Lightweight material. Smart grey shift dress from Tabitha at Anthropologie. Grey quilted / textured fabric with black contrast panels arranged for a flattering silhouette. Side pockets, concealed rear zip. Excellent condition. Model : Nova Lace Pencil Skirt. Pencil Skirt. Material: Polyester; rayon lining. Colour : Black and White. Size : Small. RRP: £148! ANTHROPOLOGIE, All-over Sequinned Tunic Midi Dress. - Midi length. 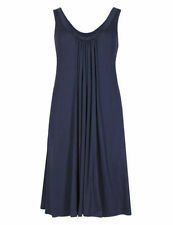 Colour: Navy Blue/Midnight Blue. Model : Colour Saanvi Maxi Skirt. Size : UK14. Colour : Moss Green with multi colour floral print. Side zip fastening. Colour is a pale oyster / eggshell colour. Size is UK 8 but is generous so would fit a 10. Only worn once. Features two large front pockets, collarless and large hidden poppers. Underarm to underarm approx 19”.